Three months of Bible readings based in the books of Daniel, Nehemiah, Revelation and John. 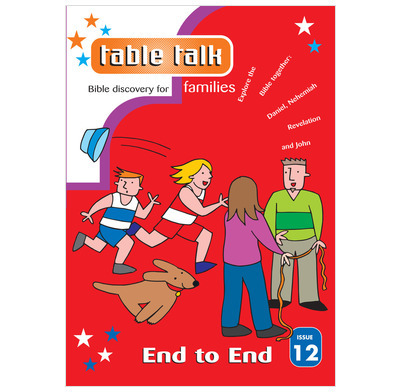 Issue Twelve of Table Talk is called End to End. It contains three months of Bible readings based in the books of Daniel, Nehemiah, Revelation and John. We'll read about the very first Easter in the Gospel of John. We'll also meet Daniel, find out how the Israelites came home in Nehemiah, and explore the last book in the Bible - Revelation. As with the other issues in the series, we have found this valuable in giving us a biblically based focus for our devotional times. I would recommend it for any family with primary aged children who want to make regular bible reading a part of their lifestyle! These have worked really well for us as a family for several years - our children are now 8 and 10. Even though older children get more out of them it is a good habit to get into when the children are younger as it sets the tone for later years. My daughter always gets excited whenever 'hang man' comes up! Each 'study' seeks to be faithful to scripture and strives to make a relevant and applicable point from the text. Would be great to have a similar resource that worked through a whole book - such as a gospel. We use the Table Talk at our family breakfast every day and take about 10 minutes. The notes are excellent and require minimal prep, although I would recommend a quick read the day before to see what else you could include. It's great to take the children to the Bible at the start of each day and they loved to locate different events on the 'Timeline' that comes with End to End edition. Best used with 5+ as it requires a bit of concentration which is still absent from our 3yr old.